Tourism is the biggest industry in Vanuatu. Recently, I’ve noticed more people doing “destination weddings” here. It may just be that I moved into town where the “destination” part is more likely to happen, rather than that there is any real increase in weddings, too. On Monday evening, I got to see this industry up close. While I’ve been visiting Santo, I’ve spent some time playing tourist. Though part of it is research, part of it is that my visit happened to coincide with another volunteer’s family coming into town. I’ve been tagging along on the more interesting events for that. On Monday, his mom and step-dad got married on a beach in Vanuatu. Honestly, I just like this shot. We arrived at about 5pm, just as it was starting to get dark. They immediately swept Andrea away and into a private hut to change clothes. And by change clothes, I do mean reduce clothes. She walked in wearing a lovely blue dress and walked out wearing a lot of leaves. The mama who made the skirt, neck piece, bra and crown was a super cute older woman. I learned later that she loves to dance because she totally got down with the PCVs. I was the photographer for the women’s part. Mike did the photography for the men’s part. So, I don’t have any pictures of what happened to Bill, nor do I have any idea what happened to him. By the time we came out, he was safely dressed in a nambas and surrounded by a bunch of young men. Off to the “new island” for the bride exchange. Chief on Land: You can’t land here. Not unless you pay me pigs. Chief on Boat: I don’t have any pigs. Land: Then you have to fight my warriors. Boat: I can’t fight your warriors. Land: Then your daughter has to marry my son. Boat: My daughter will marry your son. The “procession” to the marriage arch. Accompanied by string band. The two on the boat disembarked and they walked to the group of men where the happy couple were formally “introduced” to each other. Then we walked over to the archway they’d covered in leaves an flowers and a priest performed a short ceremony. I wasn’t listening to most of it, I was busy taking pictures. They exchanged rings made of coconut leaves and then the priest blessed the union. The boys who had been warriors during the skit turned out to be a string band who played the first song for the happy couple to dance to. After the first dance, we took a break to cut the wedding cake, which was yam laplap. The happy couple toasted their marriage with green coconuts and we got back to dancing. (Neither of them liked the coconuts so Hunter and I drank them instead.) We all munched on fresh fruit, sandwiches and fried tuna cakes while a couple of the guys went to get kava. We toasted with the kava and called it a night. Blessing the joining at the end. It was a fun, cheesy fusion between island and western. I enjoyed it and the rest of the volunteers there seemed to, as well. 4-1 Karis Came to Visit! A few weeks ago, Jason’s sister, Karis, came to visit. It was awesome. It was also a very different experience having visitors this time than it was the last few times. First off, on the island, taking a week or two off to hang out with family was no big deal. I mean, we tried to organize it loosely around the school schedule, but only loosely. It just wasn’t that big a deal. This time, we had to specifically take time off from work to host and we had to do all the official stuff like submitting paperwork and talking to bosses as we did it. Once we had the time off, using it was very different. On the island, we could fill an entire week just living and when we had guests, that’s what we did. Maybe we’d take a walk to the waterfall (just over an hour each way) or to the garden (about an hour each way) or we’d go visiting in Melsisi (just under an hour each way) but mostly we hung out, cooked on a fire and relaxed. That was the island pace of life. Now, we are on town time and it shows. We expected ourselves to keep Karis busy and entertained consistently, everything from going out to kava to meeting up with volunteers for chances to hang out and chat. Then there was the difference in town activities. When we lived on Pentecost, town was time to eat out, get internet and be white. Now, town is where I live. I have internet, cheese and whiteman time whenever I want (mostly, though the internet is still pretty poor). That doesn’t mean I don’t like to be on the internet, but it does reduce the compulsive need to be on any time I am anywhere near a computer. The same goes for dining out. Though I enjoy going places that make food I don’t know how to cook, the expense starts to make a dent in the Peace Corps budget, so we only go out once in a while. Even things like eating rich foods or spending on extra buses is a stretch. All of that influences hosting. Hosting this time was more of a balancing act between being on vacation and being in normal life. It wasn’t all a problem though, what we lost in expense and laziness, we made up for in convenience. By living in town, we didn’t need to travel to pick up Karis or rent a room in transit from one island to another. We had things like a fully-stocked kitchen and a shower, all the time. We know where the best restaurants are and when they are open. We know where to go for kava and how long it will take to walk there. We have friends who do fun and interesting things like American dinner night. We have a life here, one that we can invite people into. Karis’ visit went really smoothly. We had no travel problems (again, living in Vila is easier) and the timing on most everything worked out. Karis got her SCUBA certification while Jason and I were at work the first week and then she and I wandered around town at the end of the week. They went to Tanna from Sunday to Wednesday and left me a bachelor in my house. Even that timing worked out well for my need for some personal space. The one low point was when Preston and Shelley were supposed to come for a few days and Air Vanuatu canceled their flight. I don’t see how Air Vanuatu is having a positive impact on tourism when they do stupid things like that. I was really disappointed that they couldn’t make it. We found other ways of amusing ourselves. We went SCUBA diving, which finished Karis’ certification and started Jason’s and mine and we wandered around the markets. Karis and I spent a day at Le Lagon, pretending to be tourists with other Volunteers. We went out to kava almost every night, though not everyone drank every time. We went shopping in the market and at the tourist stalls by the water front. Karis followed me to work and listened to ridiculous conversations in the Peace Corps office. I think she got a good impression of what our lives are like here. It was fun to have her visit. Each time we’ve had visitors, we’ve enjoyed it. It is a chance to remember how awesome and special this place is and how lucky we are in our friends and family. This really is a unique experience and each time I share it with people from home, I get to see it fresh. On Pentecost, we drink kava. Pentecost produces huge amounts of kava for immediate consumption and for sale to other islands, Vila and a very small portion as export. When Man Pentecost has had a bad day, he heads to the nakamal to work his frustrations out on a kava grinder and relax with a shell or six. He does not grab a beer. Beer is for special occasions and is drunk with intent to get good and drunk. The French officers were not impressed with kava. They wanted their beer. So, they went to the big store and bought beer. They bought up all the beer that wasn’t Tusker (local beer, worse than Coors Light); that is all 32 cans. Yep, that was all the beer in Central Pentecost. It didn’t take 7 army officers to go through 32 beers. In fact, it took about four days. The ship doesn’t come through for another week, and even then there is no guarantee of beer. They were extremely kind and shared their beer with us, but I think we finished it. On Tuesday, they bought all the Tusker at the big store, all 18 bottles of that. Because I am in Vila, and because they were nice to me and I like to help, I offered to try to bring back some beer. Now, I’m flying which means I have a 5 kilo carry-on limit and a 10 kilo checked baggage limit. Then I have to pay overage. I explained that situation to them via Hannah who was kind enough to translate. After much discussion, they decided that yes, I should bring back beer. After some more discussion, they decided I should bring back as much beer as I could get on the plane and they would pay whatever overage to get beer. That conversation took about fifteen minutes. At the end of it, I was also asked to bring back 10 rolls of garbage bags. I guess I am now an alcohol importer for the French army. It will be really interesting trying to get all this on the plane. The rum can go in my carry on with all my clothes and I won’t let them weigh that. The beer is a different story. I think I’ll have to borrow the medical office’s scale to find out how much a box of beer weighs, in kilos. Then I’ll have to print off or write a bunch of signs with my name on them and tape the boxes up well enough that they will not be recognizably full of beer. I’ve shipped stuff in alcohol boxes before, but I’ve never shipped the actual alcohol. I think I can check something off my bucket list. It seems like everyone should have a goal, military or not, of being invited to dine in the officers’ mess. I can mark that goal as complete. We went to church. After church we were just bumming around and chatting with our English neighbors when the head of the French army encampment came wandering over. We got to chatting, and by ‘we,’ I mean him and Hannah because he spoke very little English and I speak no French. After an hour, he offered us some of their combat rations. Then he invited us to dinner. He said to come around 7:30 for apperetif. What? There are many confusing things about that statement these days. The first one is being told a specific time. My time works along the lines of “morning,” “lunch time” and “evening.” Then of course, there is the part where 7:30 is about an hour before bed. Seriously, I get ready for bed around 8:30 and read for a bit then fall asleep. 7:30 is late. Then of course, the word apperetif. It took me about fifteen minutes to remember that in French, that means alcohol. What? We showed up at 7:30. We even put on real clothes, like you know, a long sleeve shirt and a clean skirt. Jason showered for the occasion. We did in fact stand around and have a cocktail hour. Of course, the cocktails were VB, twisties and peanuts, and we were standing on uneven grass that was edging towards ankle deep mud, but whatever. Still a cocktail hour. Then we sat down to a three course meal. Again, What? I live on a piece of tropical rock in the middle of the Pacific Ocean. My variety of food more or less consists of taro, yam and cabbage. We had cucumber salad with a really nice dressing as a first course, mashed potatoes and duck as a second course (I didn’t have the duck) and beneits with nutella for dessert. That is more variety of food than I have had in months. And again, it was a surreal combination of three course French meal under a tent, sitting on folding camp chairs, at a folding camp table on a slope that if I picked my foot up off the edge of my chair it tipped back in a rather alarming way. To top off an excellent evening, I had a really fun conversation with the woman who I think is the sergeant in charge of their logistics. She spoke a little English, not a lot but I think it was an issue of being out of practice rather than not speaking it. I thought she did great. Jason told me later that one of the other officers referred to her as crazy. I agree, but she’s totally my kind of crazy. We had a conversation that had a lot to do with hand gestures and curious looks and occasionally asking the doctor to translate for us. I felt bad for Alexandra who was stuck dealing with both of us being all riled up and crazy like. Jason was sitting by the main English speaking officer. They had a lively conversation going, though the only thing I caught of it all evening was the word “tipskin.” I guess they were talking about nakol and the circumcision rituals. Or something. I had a great evening. My life is truly bizarre. I am not such a fan of things like war and hurting people. I don’t think that mandatory military service is a good idea. That’s why I’m in the Peace Corps. On the other hand, for a select population, I think the military is an excellent choice. That population includes people who need a steady income, could use some personal discipline, don’t find violence or the use of necessary force to be utterly abhorrent, and need a stepping stone into a career. 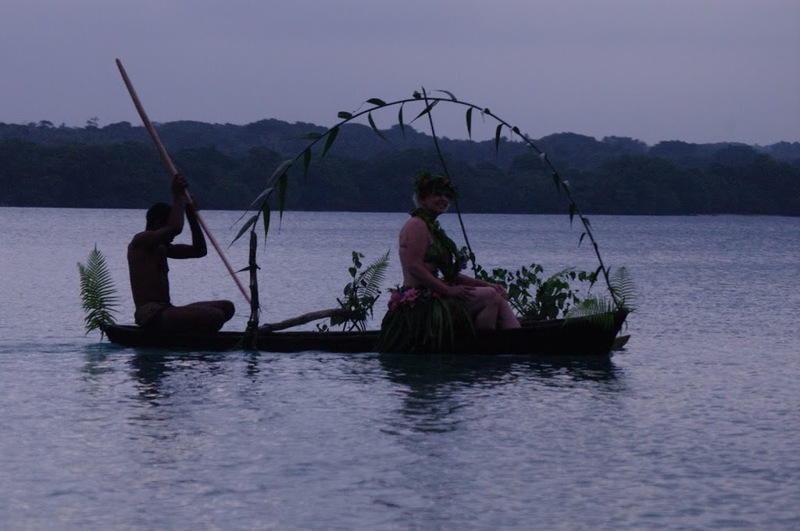 In Vanuatu, there are very few people who couldn’t use a strong dose of all those things. There are very few paid jobs and fewer yet that actually get paid on time; the island lifestyle is conducive to a free form sense of time and motivation, you do what you want when you want to and there is no urgency to any of it; there is no strong stigma against things like slaughtering animals, which allows for less stigma around the use of necessary force; and many of the career jobs are based on a system of nepotism. It makes something like the Vanuatu Mobile Force (VMF) look pretty appealing. Which brings me to the rant of the moment. When I ask a child in the US what they want to be when they grow up, I’d get things like: princess, cowboy, doctor, vet, movie star, singer, president, knight, teacher, nurse, pilot, postman, and the list goes on and on. Here, I asked a fifteen-year-old what she wanted to do when she finished school. She looked at me blankly. I asked her what she would want to focus on if she went to year 12. They have to specialize in year 14, but they are divided into arts and science in year 11 or 12. She continued to look at me blankly and finally said, “Go to school.” I asked her what she wanted to go to school for. She thought about it for about 2 minutes and finally said, “Teacher?” like this was a question with a right and wrong answer and I was quizzing her. I asked her what she wanted to teach- kindi, primary or secondary. She thought about that for awhile and said secondary. I got the impression that was the first time she’d ever considered that there are career choices. I don’t think she realized she had options. So much of American, and Western, society is about choice and individuality. We tell our children stories in which the hero is a knight or a princess or the president (though never a congressman…) or a doctor and by doing so, we teach them that they can grow up and do these things. It is something we take for granted that this is the way the world works. Here, the children grow up on stories where there are 4 characters: chief, village man, village woman and magic person. That’s it. The media expands things to: soldier and popstar, but they are always white. The community role models expand the options to nurse and teacher. So, when I ask a child here, what do you want to be when you grow up? They say nurse or teacher. What about the children who would be amazing film makers? Or computer techs? Or chefs? What about those kids that don’t excel at school but are stellar football players? Or the ones who hate reading but love to ask questions of the universe? They don’t have a place here. I look at the mid-class students, the ones who don’t excel but they aren’t failing either, and I think about this. If those students were exposed to a wider variety of career choices, of lifestyle choices, would they excel? I think the limit on the number of careers and career options here leaves those students without a goal. They don’t know what is possible so they accept their fate and become mediocre farmers, just like they’ve been mediocre students. I hope the army coming will open the door for a few of them to see some other career options and pursue a passion instead of an obligation. 7-5 The French Invaded Melsisi! The French army is doing some good-will building stuff with the Vanuatu government. The Ministry of Health selected the Melsisi Health Center for an upgrade to a mini-Hospital. I’m not totally sure what that means, I’m not sure anyone outside of the Ministry is sure what that means, but it sounds pretty good. There are now 81 French soldiers, 6 New Zealand soliders and 6 ni-Vans from the Vanuatu Mobile Force (which encompasses army and police) running around Melsisi. Technically, I think the French and Kiwis are marines, but whatever. They arrived on a Big Ship. Seriously, the ship was nearly the size of Melsisi. We walked over to see it because we have become man bush smol. What else did you think I had to do today? (Actually, I had scheduled a workshop for this morning but it got canceled on account of the Big Ship coming, so I had something better to do but it was canceled.) They were scheduled to debark at 0600. Of course, this is still Vanuatu, even if it is the French army. The Brisk, one of our cargo ships, came at about the same time. The smaller and more nimble cargo ship slipped into shore and unloaded while the French Big Ship was still dancing around. They didn’t actually debark until around 7:30 or 8. The community did a really nice welcome. They lead the delegation of French officers to the sports field with a kastom dance where all the students in Melsisi – kindi through year 13 – sang the French national anthem, the Vanuatu national anthem and the Penama provincial anthem. They did it up proper on the kastom dance, they were all in malmal in their tsips (aka, red mat loin clothes). Even the women took their shirts off and did the proper red mats, though some of them did keep their bras on. (Proper kastom dictates that people be mostly naked. I love the tropics.) The kids did a good job on the songs and the kindi kids were super cute. They were really well-behaved through the speeches. I guess ni-Van kids are as good at waiting as their parents. The speeches were shorter than I expected. I think the weather contributed to that. I didn’t understand most of the talking because I still don’t speak French, but the general gist was “We’re glad you’re here! Yay!’ There were several officers, a representative from the provincial office, a representative from the chiefs of the area and a representative from the Ministry. The chief is a friend of ours, so we made sure to take some good pictures of him in his red mat loin cloth with the military brass. While the speeches were going on, the grunts got the job of modifying the beach for landing. The beach is pretty sharply angled, which wouldn’t do. They got to dig gravel for an hour or so. Poor guys. Before the boat could come in, they had to check to see if the reef had space for them to beach. They sent down two scuba divers. (Badass moment of the day – diving knife strapped to the calf. I want one.) The scuba divers gave the all clear, the diggers made the beach the right grade and the ship came to shore. They just doubled the number of vehicles in Central Pentecost, I think. They brought off 3 camions, an SUV and a fork lift. That about sums up the number of trucks we have. Then the soldiers got off and started carrying things up the hill. We left when they were still unloading. I guess I’m not that much of a man bushyet. *For all the non-American readers (and the Americans who don’t read enough American classics): During the American Revolution, Paul Revere and about 4 other guys were sent to warn the people of New England that the British forces were on the move. Along with the verbal message that was passed, they were to light lamps in a lighthouse: one if by land, two if by sea. While Julie was visiting, Jason and I had set up an overly-complicated plan to connect on Pentecost. The plan was that Jason and Julie would catch the morning flight from Vila to Pentecost and watch land diving. That same plane continues on to Santo then turns around and does the same route going back. I was going to catch the plane in Santo and meet them on Pentecost about the time that land diving finished and we’d all go back to the village together. This was a nice, tidy theory. The reality was a bit different. On Friday, I got a call from Air Vanuatu saying I’d been moved to a Sunday flight. (They’ve added a Sunday flight during land diving.) I called Jason who was in Vila to go find out what was going on. He got me switched back to the Saturday flight. The camp was in South Santo, which is about an hour from town. I jumped on the early truck into town, just in case. I figured I’d hop out at a good restaurant, have a nice meal and get some internet then go to my 11:30 check-in. We got in town and I pulled my bag off the truck. As I’m standing and waiting to say goodbye to people, Jason called. He had just checked-in for his own flight and asked about mine. It was cancelled. I throw my bag back in the truck and jump back in. Being in town isn’t going to sort this out, but maybe I can get space on the flight going to Vila and transfer through there. At the airport, the flight has a 20 person waiting list. The plane only seats 65. The flights were too full and there was no way I could transfer through Vila to get to Pentecost. The guy at the counter felt sorry for me and sent me to go talk to someone in the back office. I chatted with the guy in the back office for an hour. He dealt with about four other people while I waited and chatted and played politics and Peace Coprs. I was hoping to get to Vila and wait for Jason and Julie there for a few days. The nice man got me on the plane to Vila, though still no chance of a transfer through to Pentecost. I would get a refund of 5000 some vatu (about $50) because I was no longer going to Pentecost. I went back to the waiting area and sat with my friends. Five minutes before boarding, the guy from the back office came out and found me. He asked, very nicely, if I would give up my seat to someone who was supposed to be on this flight. I couldn’t very well say no, so I went with him to sort the situation out. We got to the counter, I handed him my boarding pass, and asked for my luggage back. (They had deemed my backpack too big to be carry on.) I had to go get my luggage ticket. They gave me back my boarding pass and I ran to get in line before something else could keep me off the plane. We arrived in Vila and had to wait for our luggage. The domestic terminal is one big room with check-in on the left and arrivals on the right. The luggage comes in on a trolley and you go grab your bag. I glanced over at the ticketing counter and see the name of my airport still on the sign. Curious. The name is only up while check-in for that airport is open. I wandered over, just to check and see. Yes, there was another plane leaving for Pentecost. No, it wasn’t full. Yes, I could change my ticket and go there. The nice man at the ticketing counter went and talked to the guys in his back office who changed my ticket around again. They re-set the ticket as a transfer through Vila, which means no extra charge to me. The flight was actually leaving at 3:45, so I had a few hours to kill. I checked-in and hung out at the terminal. We boarded. There were 4 people on the flight, including me. At 4:45, my plane landed on Pentecost. Jason and Julie met me at the airport and we went to Vansemakul. We arrived in the dark, but all of us were there. Back in Vila, we spent Friday re-packing for the island and wandering around town. We headed to Pentecost on Saturday. Air Vanuatu had apparently received more bookings than usual to go see Nagol (land diving) and took two flights. We got on the later flight which left time to go cinnamon rolls. Once we arrived, it was straight over to the dive site. They put on a dive for tourists right at the airport so it was a very short walk. There were a lot of spectators. The weather was mostly cooperative. It didn’t rain and the clouds even wandered off for part of it so we could get some good pictures. During the week, there had been some back and forth about whether Gaea was going to be able to make it to the island. She had been in Santo for a Peace Corps workshop. Air Vanuatu ended up canceling her flight and didn’t have space to connect through Vila. After a trip to their office where I was told the flight was still on and she could get back on it, we checked again Saturday morning. It was cancelled. She talked her way onto a flight through Vila which got her back in time to catch the last plane that was coming for the tourists. I had just enough service to find out that she was coming and hold the boat. When she got in, we loaded into my papa’s boat and made the trip up to the village. Meeting the host family before dinner. Since the flight got in late, the sun was setting and it was dark by the time we got home. Night time boating is cool but unfortunately there were too many clouds to get a good view of the stars. There were algae or small glowy fish in the wake of the boat, so I think that made up for it. Sunday we got to show my mom around the house and a little of the village. We decided to walk over to Melsisi for church so that she could see my site, too. It’s a long walk but pleasant and we were in no rush to get there. After church we took her around to shake hands with the people we spend time with and gave a little tour of the school. After resting at our house over there, we walked back to the village. That evening, we went down to my family’s house for dinner. As always, it was a little awkward but we’re used to that. My papa enjoyed showing off his pigs while we waited for food. My momma can cook some pretty good white-man acceptable food so it wasn’t too bad. My mom even tried the laplap (which was taro, the best one.) After dinner, my family gave my mom a basket and a red mat and I handed out various presents she had brought for them with the appropriate toktok(small speech). Monday we were headed back to Vila. We caught the afternoon flight and spent the morning at Waterfall. My momma and my sisters joined us in going for a swim. This involved my little sister getting tossed into the water a couple of times and was great fun! Eventually, we got back in the boat and down to the airport. Coming into Vila always seems to entail being busy and this time was no exception. Tuesday, I had a meeting with the Vanuatu Institute of Technology and Wednesday I had a safety and security training. Gaea hung out with my mom and did some shopping and read. Thursday, I was finally free again. My mom rented a car and we checked into Aquanas Resort where she was putting us up. Staying at resorts has been one of the most fun things we have done with family when they came to visit. Aquanas was a very nice resort with a pretty beach (parts of which have wi-fi) and fantastic food. There was also AC in the rooms and the internet was quite fast for Vanuatu. It was so nice that we decided to just hang out at the resort on Friday. Reading on the beach, going for a tour around the lagoon in kayaks, playing around on the internet, and eating delicious food. It was a good, relaxing day. Meeting the training family, getting an island dress. Saturday, we drove around Efate. There is a black-top road the circles the whole island. I had called my host brother from training to tell him that we were going to go out. He failed to let the rest of the family. Even with no warning, they were very excited to see us. Unfortunately our mama wasn’t home but our sisters cooked lunch and gave my mom an island dress. We walked down to the ocean while lunch was being cooked and then storied while we ate. We handed out a few small thank you presents to this family as well. On the way back to town we stopped at Onesua School and took a tour around with Tim, the volunteer there. The last night at the resort we filled with delicious food. Every meal, we would banter with the staff. I enjoy surprising ni-Vans by telling them that I live on one of the outer islands and drink kava, especially the ones that work at resorts and are used to tourist white people. This is where we ate most meals. The next morning, we had a last breakfast on the beach and said goodbye to the wonderful resort. After dropping our stuff off at the cheap Peace Corps dive, we went with my mom to the airport to say goodbye. We saw her off to security and she has now arrived safely back in the US. It continues to be wonderful having family come visit. Not only is it fantastic to see them, but it also means they really get what we’re talking about when we call home. They’ve seen where we live and met some of the people. Having people back home who can relate means a lot. The latest in a series of visitors, my mother has now come to see what life is like here. She ended up arriving on Mothers’ Day, which was very appropriate. On Sunday, I was able to meet her at the airport in Vanuatu style with a salu-salu (lei) and a green coconut. I also convinced a couple of the other volunteers to come with me. It turned out that another volunteer had a friend coming on the same flight so there were plenty of us as a welcoming party! After collecting my mother, we made our way back to the Peace Corps office. We did some introductions and sorted out our stuff. Due to jet-lag, we took it slow the rest of Sunday and Monday. There were a few errands to run, flights to pay for, etc. There was also plenty of hand shaking. Any time family comes to visit, the staff is very keen to meet them. Tuesday morning we got up bright and early to head down to Tanna. Check-in started at 6 but there wasn’t anyone in the terminal at all when we got there. This is typical of Vanuatu. We ended up standing outside and chatting with an Aussie couple until they opened up the check-in. Morning flights to Tanna are generally on the ATR (big plane- its got 65 seats). Air Vanuatu puts quite a bit of effort into making this a “real” flight experience. There are two stewardesses and a drink service. Did I mention that the flight is 35 minutes? Not worth it if you ask me but they like to show off for tourists, I guess. After landing, we waited in “baggage claim” which was WAY too small for the number of people in there. After finding our bags and the truck to the bungalow we made a quick stop to pick up another PCV before heading across the island to the volcano side. The puppy had a dance party. Rose was skeptical. The west side of Tanna has pretty good roads for Vanuatu. As soon as you get to the top of the mountain range crossing the island, however, that changes. They’re doing a massive project to improve the crossing but the first half won’t be finished until June and I’m not sure how quickly the second half will get done after that. My mother got to experience just how bouncy island roads can be. She was not impressed. More impressive, however, was the view which included Mt Yasur. We stopped for pictures. Volcanoes in the tropics offer a sharp contrast. As you’re driving along, you pass lush jungle, lush jungle, lush jungle, desolation, lush jungle, lush jungle… It is one of the most interesting things about them. The driver was dropping a relation of his off at a village, so we got out and wandered around part of the ash plain for a bit. Smaller than Mordor but I definitely got a feeling for what that would be like. Once we finally got to the bungalow, we dropped our stuff off and promptly turned around to walk to another PCV’s village. I had never been there and was unaware of just how far it was. It was not a ridiculously strenuous hike but it was definitely not a walk in the park. We got there while Jake was in a meeting so we waited at his house and storied with each other as well as a few ni-Vans who wandered by. Jake came home and we met the litter of puppies living under his house. The puppies are adorable, if a little mangy. 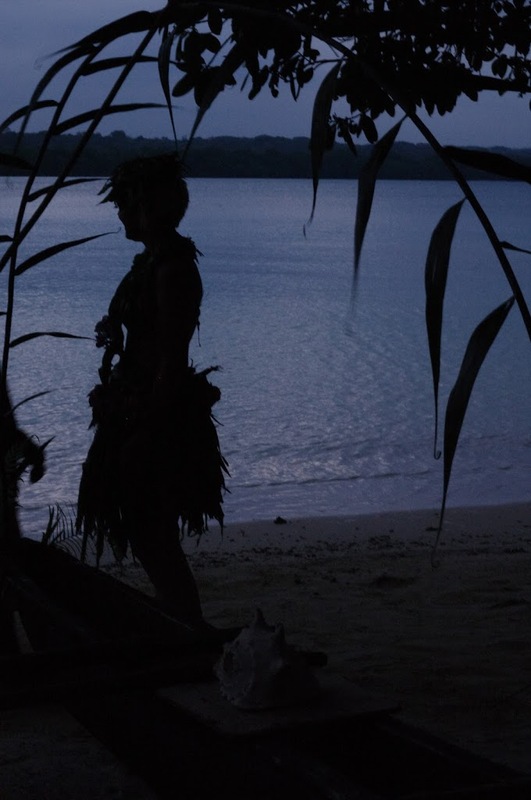 Eventually we found a couple youngfala to chew us kava so that we could drink a shell before walking back to the bungalow ahead of night fall. Yes, on Tanna, the kava is chewed, generally by young men. It doesn’t taste too bad but is not the most hygienic. Wednesday morning, we went to a kastom womens’ dance. It was a half-hour walk out to the village where they were doing the dance. When we got there, they apologized for having few people but apparently a number had already gone to the garden when they hit the tam tam drum. It seemed a perfectly fine dance to us. Afterwards we gave the kids lollies and got the language word for thank you to tell them. Then it was back to the bungalow. I chatted with our guide (who was the daughter of the bungalow’s owner) along the way. It’s always fun to surprise people by being able to speak Bislama. They’re so eager to story with us. We spent the rest of the day hanging out around the bungalow, reading our respective books. It works out well that my mom and I both really enjoy relaxing with a book. It also worked out very well throughout the trip that she eats small portions. Most of the places we stayed served a basic plate of rice, veggies, and meat. Not much choice but tasty. My mother would eat about half of her plate and I’d get a plate and a half! After a relaxing day, we went up to the volcano that evening. We decided to walk up rather than trying to get a truck. It took about an hour which was fortunately up a fairly gradual slope. Walking up let us really examine the transition in the ground as we got closer to the volcano. It was very cool. We started finding more ash, then a few places where the ground was smoking, then finally the end of green as we got right up to the rim. We arrived with plenty of daylight left and not many people there. It is possible to walk around most of the rim of the volcano, depending on how strong and in what direction the wind is blowing. One side is a bit steeper and had more ash being blown towards it. We spent some time trying to get good pictures of the explosions and I went around to both sides. As it got darker, more tourists arrived and the explosions got more impressive. We managed to get the obligatory explosion-in-the-background-portrait photograph. Eventually, we decided to start walking down. After a while, the trucks started to catch up and one was nice enough to give us a lift to the bottom. Thursday morning we made the trip back to the west side and checked into a guest house just outside of Lenekal. There are three “towns” in Vanuatu. Port Vila is the capitol and the biggest. Luganville is the main town on Santo. It is much quieter but still very well built up and stocked with things. Lenekal is referred to as “black man town”. It’s A LOT more rural. Plenty of people but no big concrete buildings and very few stores (all small shops.) Ship captains refuse to dock at their wharf because it is poorly positioned and two ships have sunk while docked. The ships bring in, or in this case don’t bring in, supplies, which leads to small and poorly stocked shops. We were originally scheduled to fly out Friday afternoon but decided to switch to the morning flight. There wasn’t much we wanted to do in Lenekal and I had found out about an Information and Communication Technology day back in Vila. Switching flights here is incredibly easy, you can do it over the phone in 5 minutes and there is no fee. It’s a good thing we ended up checking in early because there were plane issues and we ended up on an 8-seater. Not everyone who was booked on the flight was able to actually get on. We were joined by a group of New Caledonians who were very nervous about the plane (but in a laughing, upbeat way) and a ni-Van who joined me in laughing at/with them for it. We had visitors. Many of them, some serially, some overlapping. We made plans for our neighbor from the south to come visit. Her mama’s church group was coming up to Central Pentecost so she thought she’d come for a visit. The day before they were meant to come, her village got in a row(argument) with another village. The argument escalated quickly to violence and the church trip got canceled. After a day of hiding in the bush, sleeping under guard and generally acting crazy, she decided she needed a break from her village. She came to visit us. Lucky for us, her boat driver’s luck was strong and he caught a bunch of tuna on the way up. He caught enough that he gave us two, which I promptly shared with some folks in my village. We had to figure out how to gut the fish we kept. We got as far as stab the knife in and realized that between the three of us, we hadn’t a clue how to gut a fish. Our collective knowledge got as far as, “Well, I saw someone do it once when I was younger…” That was insufficient for gutting our own fish. One of my mamas walked past, so I sang out and asked her for help. We gave her half the fish in thank you for gutting it. As it was, there was still more than the two of them could eat and I had my obligatory bite. The next day, the volunteer in North Pentecost called us up and asked if he could come down for a visit. One of the ships was coming through and he could jump on to get down the coast. Of course, we said yes. He came down midday while we were at a volleyball tournament. He got dropped off at the dock by the tournament and we spent the day doing that. As of tomorrow, they will be leaving us to head south. The northern PCV meant to go back that way, but the ship decided to skip Pentecost on this trip so he has to wait until the next one. He’s going to go walk about for a week and head back to site early next week. Tomorrow, we will be hosting our boss. She came in on Monday and has been staying at the house in Melsisi with Alexandra. She will be staying with us for three nights and doing an official “site visit.” the idea is that Peace Corps tries to keep tabs on the volunteers by visiting once a year to listen to the community’s concerns and the PCVs concerns, or just to hang out and see if we’re still alive. She meant to come for two days. This is Vanuatu so she’ll be staying for five. The same day she leaves, we are hosting our English neighbors from Melsisi. They wanted to get out of Melsisi for a night or two. Easter is coming up and that will be a long time to spend stuck in one place, so they’ll be here for a visit. I think I will be able to run a B&B by the end of the week. Next up, get sleeping space for more than one more person. It can’t be a proper B&B if you have to sleep on the floor. Then again, there is no included laundry service.